After years of procrastinating and assuming it to be yet another one of those cheesy girl-meets-boy story (proven wrong, hence never assume), I finally read Me Before You and am completely blown away. I knew this book was essentially an emotional sucker punch, I’ve seen people cry and pull their hair after reading this, I’ve also known a few who have nothing good to say about this, I knew not to expect a happy dance after finishing it, but in spite of all that knowledge, I was still a raging crying mess after having read this. And you know what, I am more than likely to re-read it. Louisa Clark is an ordinary girl with an ordinary life. She has lived her whole life in a small English tourist town and doesn’t demand much from life. Her family and her job at a small cafe keep her contended. Until one day the cafe closes and she’s out of a job. And then there is Will Traynor, adventurer, extreme sports lover, a rich and arrogant finance tycoon living a big life in London, until one day an unfortunate accident brings him on a wheelchair, paralyzing everything below his torso, and he is stuck in his small hometown. Louisa ends up working as caregiver for Will, and so begins a story of these two completely opposite human beings. The writing is beautiful and flows in a way that you won’t notice the pages flying by, making you laugh and sob at the same time. The characters, their interactions, the family dynamics, it is all laid out with such finesse, that most scenarios and situations in the story seem quite realistic rather than made up. Me Before You is so much more than a simple love story. There is love, of course and without any cheesiness or cliches, but along with romance, the story focuses on friendship and family, it focuses on the importance of life and more so on being grateful for the things we have rather than on what we don’t. It also tackles the difficult and controversial topic of euthanasia, simultaneously emphasizing on the significance of choice. 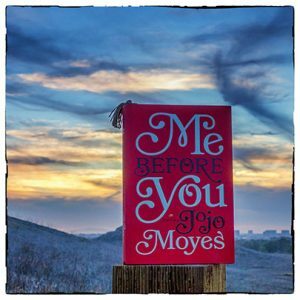 So much laughter, so many tears and a multitude of perspectives, Jojo Moyes has convinced me to read more of her works.